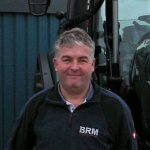 The service department at BRM is your dedicated support network for farm machinery, agricultural equipment or forestry tools. We can, with regular servicing and preventative maintenance, help your tractors and machinery function efficiently year after year. With nine mobile technicians, the BRM team can respond quickly to emergencies and breakdowns when they occur. The BRM service team is well trained and very experienced. We have access to the latest manufacturer training and special tools for Valtra, Merlo, Polaris as well as our other franchises. Our team boasts a wide age range with some technicians having been with us for over 25 years. This means that as well as the latest training techniques taught to our younger engineers, we still have a wealth of knowledge and experience to fall back on. ned testers. We are also a certified Bagma Thorough Examination Centre and have four technicians who can perform LOLER and PUWER tests. Our facilities also allow us to brake test & dynamometer test your tractor. For any queries, you can contact our service manager who will be pleased to help. Please follow this link for your Polaris service requirements.